Mercy Mission The Rescue of Flight 771 (AKA: Flight From Hell) is a sincere TV movie based on a true story of Jay Prochnow, a pilot lost over the Pacific ocean. Jay, a former US Navy pilot, was in the process of relocating a single engine Cessna 188 from the United States to Australia. During his flight, the onboard navigation aid failed, resulting in Jay becoming lost over the ocean. The only aircraft in the vicinity able to help locate Jay in the vast ocean was Air New Zealand flight 771, a McDonnel Douglas DC-10 enroute from Fiji to Auckland. Through the position of the sun, radio communications and calculations, the Air New Zealand crew were able to locate Jay’s position before he ran out of fuel. A lot of TV movies tend to be low budget and poor productions with lame stories. It certainly is an uplifting story and well worth watching. There were some minor changes from the movie compared to real life, but it was likely added to increase the dramatization or simply for time. However most changes in the movie were actually quite minor compared to the true life story. In real life, Jay stumbled across an oil rig being towed from New Zealand to Singapore, which also did help confirm Jay’s position. The location of the oil rig confirmed the Air New Zealand crews calculations to be very accurate. The oil rig does not appear in the movie. Robert Loggia as Captain Gordon Vette. 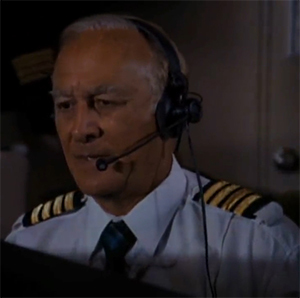 The movie starred Robert Loggia, playing Air New Zealand Captain Gordon Vette. He does a great job and really carries the traditional image of an old airline Captain. 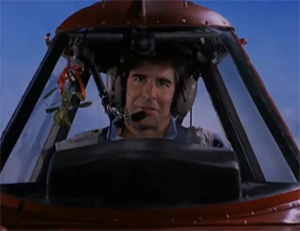 Scott Bakula played Jay Parkins, the lost pilot. He equally played the role very well. I am most familiar with his role prior to this as Dr Sam Beckett in the TV series Quantum Leap. The TV movie was filmed in both the US and Australia. It was interesting to see some familiar Australian faces pop up throughout the movie. 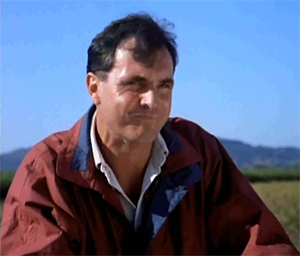 One example is Alan Fletcher, who played Jays fellow pilot friend Frank. Alan is better known as Dr. Karl on the Australian TV series Neighbours. The entire movie, Mercy Mission The Rescue of Flight 771, is available to watch on youtube. The full feature film is embedded in this article. I must admit, if it were not for yoututbe, it is quite likely this movie may have never have come to my attention. If you can find the time and your interested in aviation, this movie is certainly worth watching. If you have any questions, please feel free to contact me by e-mail or through any of the social media links listed below. Thank you and enjoy..
Alan Fletcher – Jay’s pilot friend Frank.